Home » blog » Meeting room, meeting pod or meeting hub? Meeting room, meeting pod or meeting hub? Keeping offices as flexible as possible whilst investment and development costs are minimised is a growing trend amongst WE’s clients (OR many businesses). Fortunately, manufacturers are responding with an increased range of cost effective products allowing companies to do just that. Whilst many clients are working with WE to refurbish existing meeting spaces with new meeting room furniture, or adjust how they are used by bringing in more flexible meeting room tables and meeting room chairs, some are taking things further by installing meeting or acoustic pods, meeting bays or improving breakout spaces by using more structural screen systems or high back seating. In the first of this series WE wil be taking a closer look at sealed meeting pods or acoustic pods as they are often called ie those that can be closed off completely from the rest of the surrounding environment. 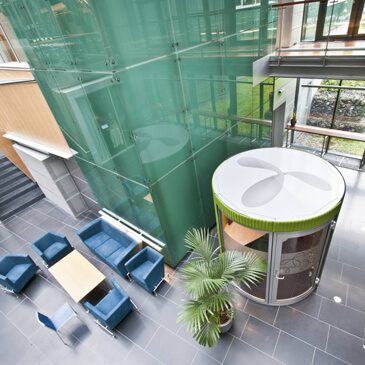 This first blog deals with some of the different types of acoustic meeting pods that are available in the UK. Orangebox led the development of products in this market with Airea meeting pods, now superseded by the enhanced Airea II system with improved acoustics, ventilation and lighting. The Airea meeting pod system offers a range of aluminium framed products with acrylic and upholstered panels to create private areas such as phone booths, video conferencing or meeting spaces. The Airea II system comes in a range of shapes and sizes with 25 standard modules ranging from 3 to 42 sq metres to meet all requirements and each of these can be tailored and reconfigured to suit your requirements by adjusting panel types and specifications. The Air meeting pod system, also by Orangebox, has newer materials, more finish options (with a mixture of interchangeable glass and acoustic panels giving future flexibility) and a unique roof system that gives even better acoustics. The Internationally patented opening roof system means this range can be used in offices with sprinkler systems. There are 17 standard modules in the range including the smallest Air-20 mini pod which creates a high quality private space or phone booth. The Air 10-17 units have curved sections for a softer feel, and the Air 22-29 units are larger more angular pods giving greater efficiency with space planning. One of the most flexible products on the market is the Quietpod system. A great range that uses laminated glass for improved acoustics and, as well as standard panel finishes, can also have bespoke options for a customised look. One unique feature is the raised floor option that can not only house the electrics and improved air flow systems but can house castors enabling the entire unit to be relocated without having to be taken apart and reassembled. True flexibility for any facilities manager! One new range that we are looking forward to seeing at Orgatec is Citterio's C-SS meeting pod range. The product has very clean lines can can be used in all types of commercial environments to create freestanding spaces that require some acoustic correction or assistance. This is a highly flexible system that can be used to create blocks of freestanding offices as well as individual meeting rooms, phone booths or focus rooms. Boss Designs Unifi subsiduary has an interesting portfolio of products in Aspect, Vista and Qube. The Aspect range is the newest product in the group and there are 4 different sizes in the range. Offering an impressive 37db noise suppression rating the frameless 8mm glass panels and 10mm door panels help increase soundproofing and privacy. The Vista range has an ultra slim aluminium profile which results in acoustics up to a 31db rating. The range is available in a range of sizes and finishes so they can be customised to suit your requirements. Its sister product the Qube system gives slightly better acoustic performance at up to 34db. Options on panel finishes, air flow systems, LED lighting and manifestation styles allow the client to customise the product to suit requirements. The Quadro system from Screen Solutions can be used as not only a stand alone system but also as a wall mounted partition system. This manufacturer is proficient in all things "acoustic" so if there are particular problems that a client is facing then WE can help you adjust the system to help solve any sound attenuation issues that you may have. These are just some of the products available that can be considered as sealed meeting pods. Which product is suitable for you? Well that will come down to aesthetics, budget, acoustic requirements and required level of flexibility. WE will discuss some recent trends in meeting pods as well as some of the preferred features that may be required for the pods in our next blogs. In the meantime, if you are considering getting meeting pods for your space then contact us as WE are happy to help you work out which product is suitable for you.